The Boys’ Basketball Program has announced their youth basketball camps for the Spring of 2019. 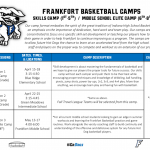 The program will hold three camps for grades 1-8. The first camp will be for 1st-2nd graders on April 15-18 at Blue Ridge Elementary. The second camp will be for 3rd-5th graders on April 22-25 at Green Meadows Intermediate School.